1. Treat stains immediately. Never allow time for a spill or stain to settle beyond the surface which can make the stain harder to remove. To easily tackle any stain, the American Cleaning Institute has a helpful stain removal chart for nearly every stain imaginable. 2. Overnight guests? Use a microfiber mop to easily and quickly clean tubs and showers without having to get inside or get wet. Spray your favorite cleaning solution on the surfaces and use a mop such as the Libman Wonder Mop to reach and remove dirt, grime and mold. 3. To prevent dust from settling on the surface of glass-topped tables, TV screens, or coffee tables, mix a little fabric softener with warm water. Wipe mixture on the surface, then rub dry with a soft microfiber cloth. 4. To remove melted candle wax from tablecloths (especially lace), stretch it over a sink and slowly pour boiling water over the melted wax. 5. Remove watermarks left on wood surfaces from glasses by mixing 1 teaspoon salt with a few drops of water to form a paste. Gently rub the paste onto the ring with a soft cloth or sponge and work it over the spot until it’s gone. 6. Make cleaning up holiday projects and crafts a breeze. Use a Libman Lint Roller to quickly clean up spilled glitter, tiny paper and ribbon pieces, and any other of those little craft supplies that seem to get stuck everywhere. 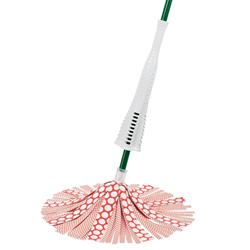 For more cleaning tips or information about Libman products, visit http://www.libman.com.